The big news this week was that the U.S. economy grew by 4.1 percent in the second quarter. This sounds like an impressive reaction by the economy to President Trump's tax reform and deregulation policy. There is just one problem: this number is not the relevant growth number to watch for. 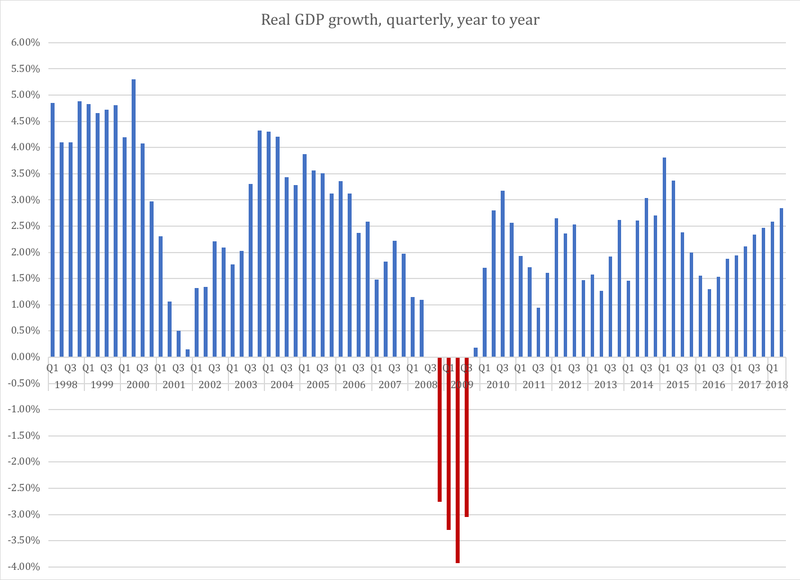 The 4.1-percent growth rate accounts for the economy's expansion from Q1 this year to Q2; what really matters is how fast the economy is growing year to year. 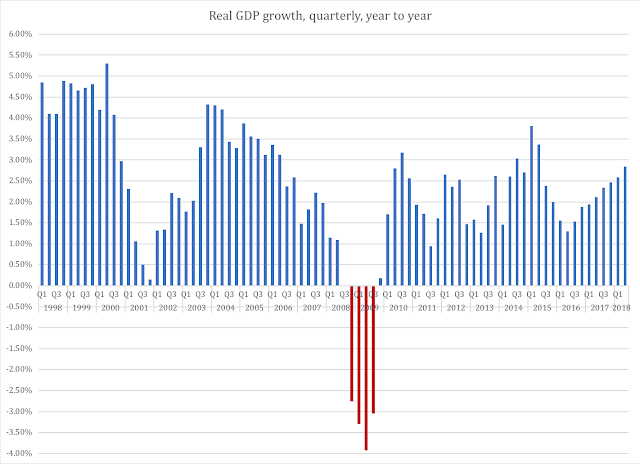 Only by measuring growth over one year, between the same quarters, can we get a real picture of how the economy is doing. Suddenly, the picture changes notably. Based on inflation-adjusted GDP numbers the U.S. economy expanded at 2.85 percent in the second quarter. * This is still an improvement over the first quarter, when the growth rate was 2.58 percent, but it is a far cry from the 4.1 percent number being touted in media. Again, President Trump deserves credit for having given America's businesses more confidence in the future. The problem is not his tax-reform ideas per se, but the long list of what is missing from it. With the growth record set straight, there is another, more important aspect of the U.S. economy that carries some promise of future macroeconomic strength. The composition of our growth is centered around household spending and gross fixed capital formation, GFCF, also known as business investments. Both are domestic, private-sector activity categories, which means that American households and entrepreneurs are doing comparatively well. The grey columns represent the two-percent industrial poverty threshold. Above it, an economy is in the zone where people can increase their standard of living over time; below it, the standard of living is stagnant or deteriorates. Over the past decade, Europe has not been above the IP threshold. Europeans in general have not been able to advance their standard of living. The U.S. economy has done a bit better, but recently - from 2016 and on - it looks like the two economies have been on parallel tracks in terms of growth. Clearly, the U.S. economy is growing because of upbeat household sentiments and good private-sector finances. Here, we have a problem. 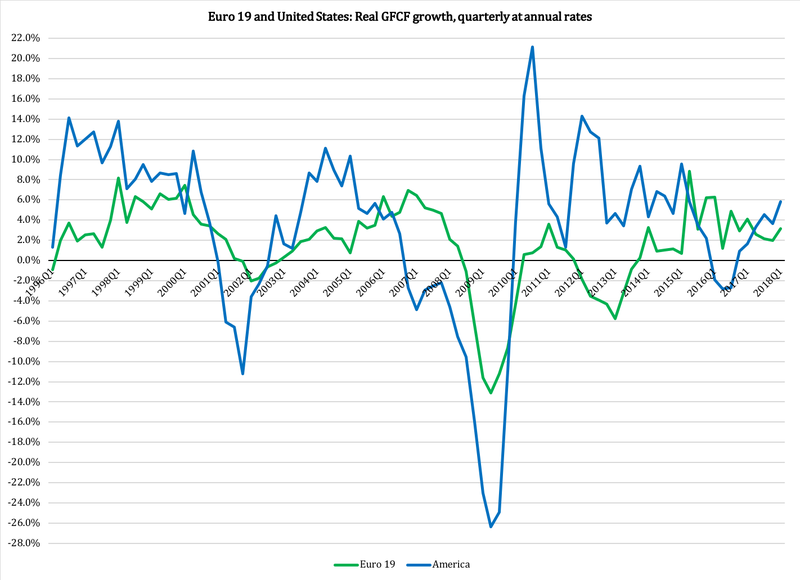 If businesses in Europe are investing at a strength similar to that in the American economy, and if household spending is not growing at nearly the same strength in Europe as it is here, then where do the incentives to invest come from? 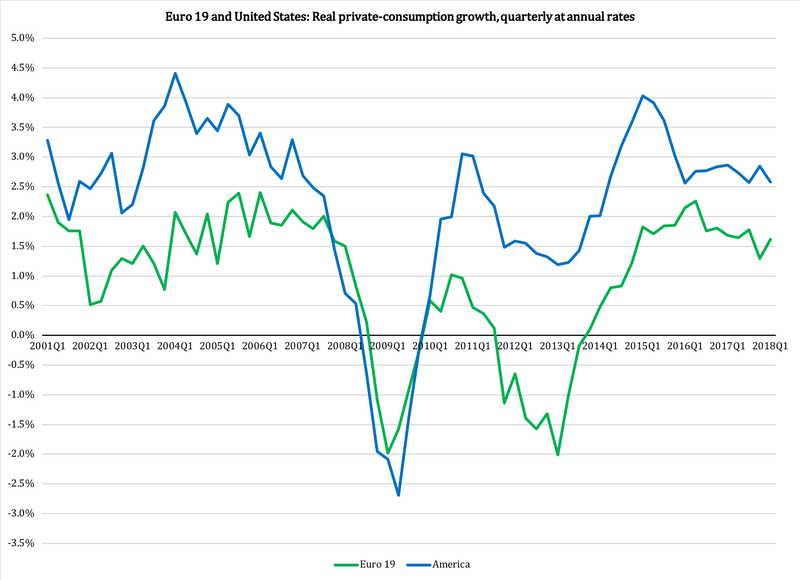 Let us keep in mind that private consumption is the largest category of economic activity in both economies (though its share of the European economy is smaller); if businesses are not investing because of strong household spending, then where do they get their positive outlook on the future from? 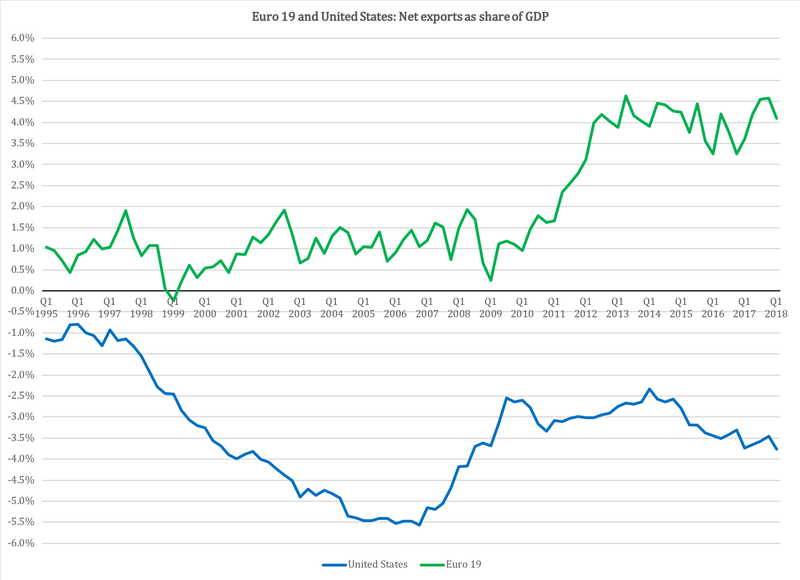 In Europe, net exports - the balance between exports and imports of goods and services - is positive, thus adding to the growth of the economy. In the United States, the opposite is happening. The practical meaning of net exports is as follows. 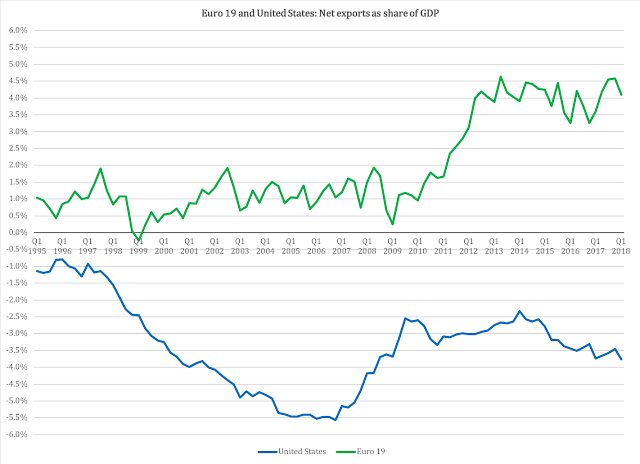 If it is negative, as in the American economy, then foreign producers are adding goods and services to domestic supply. Since production abroad does not grow our economy, negative net exports is a subtraction from domestic growth; if we had produced those goods and services ourselves, our growth would have been stronger. A positive net-exports balance adds foreign demand to domestic spending. If net exports had balanced in the European economy, its growth would have been smaller; there is not enough domestic demand to absorb all the production in the economy. Conversely, in the United States there is not enough production to meet all the domestic absorption. In other words, an economy with positive net exports is inherently weaker than an economy with negative net exports. In the latter case, households and businesses are, on average, in better financial shape than in an economy with positive net exports. From a macroeconomic viewpoint, Europe stands and falls with the global markets. The United States, by contrast, can continue to grow on its inherent economic strength. With President Trump's deregulation policy and the limited but positive contribution from his tax reform, that inherent strength will continue to grow over the next few years. We will not see spectacular growth - far from it - but we will continue to do better than Europe. Until, that is, the deterioration of our government finances, both federal and state, has gone far enough. When we reach that point, all standard forecasts are obsolete. For now, though, we can relax and be happy with the fact that despite less-than-spectacular growth rates, our economy is still one of the best and most resilient in the world. *) The Bureau of Economic Analysis has shifted index base year from 2010 to 2012. 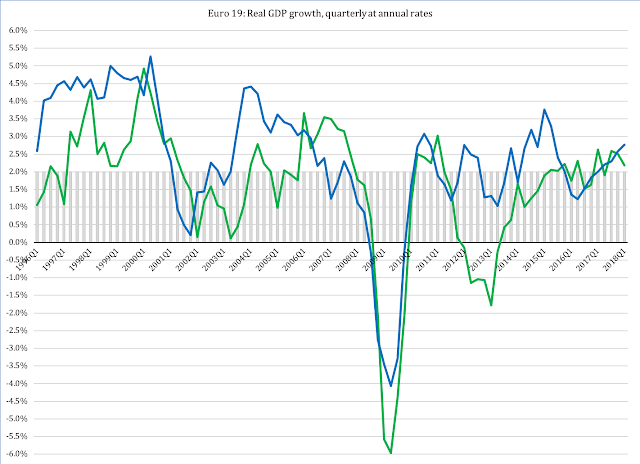 This marginally changes the numbers for GDP growth, but only slightly and without changing trends or proportions between GDP components.